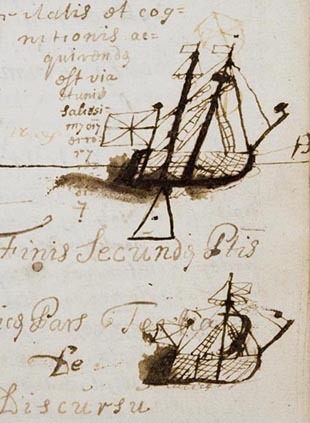 These drawings are on the lecture notes of a student, John Forbes, who attended classes on logic and metaphysics given by George Peacock at Marischal College sometime between 1706 and 1708. Peacock's Jacobite sympathies resulted in his dismissal during the purge of college professors that followed in the wake of the failed 1715 rising. The drawings are unique. Showing two ships, one flying a Scottish saltire and the other a union flag, they give a powerful and intimate insight into how the union was being contemplated by an ordinary student.